today is a very special (and kind of sad) day as it is the last day of the 12 Days of Christmas series. It has finally come to an end and although it may have gone by quickly for all of you, the amount of hours put into the series makes me grateful to go back to my normal scheduling. I have lots of fun things coming up soon so be sure to stick around and check back regularly. For today's video, I am featuring some great stamps by Winnie and Walter: Holiday Trimmings ( WNN | SSS ) and Merry and Bright( WNN | SSS ). These are great stamps to have for your holiday cards because they cover all your basic needs. 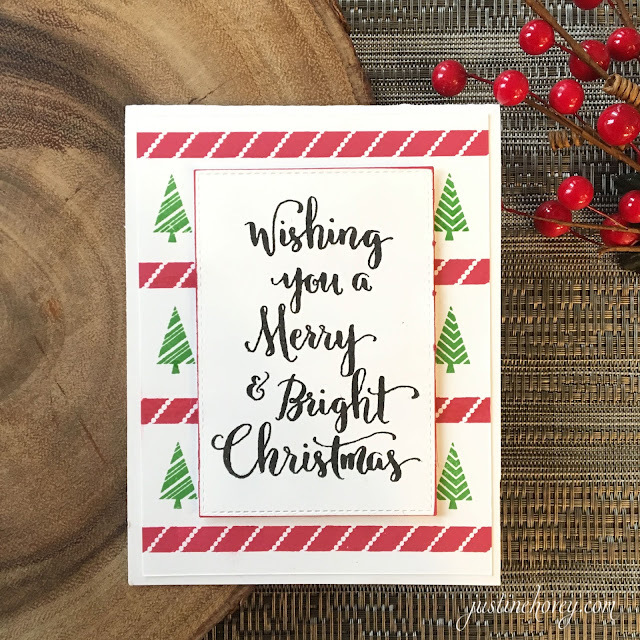 You can decorate both cards and envelopes with the Trimmings stamp and have all the sentiments you need with Merry and Bright. Throughout the video, I go through many "saves" when it comes to making mistakes. It just seemed like everything that could go wrong, went wrong while filming. But instead of making it all seem perfect and editing it out, I thought it would be nice to show you some of my recovery techniques. 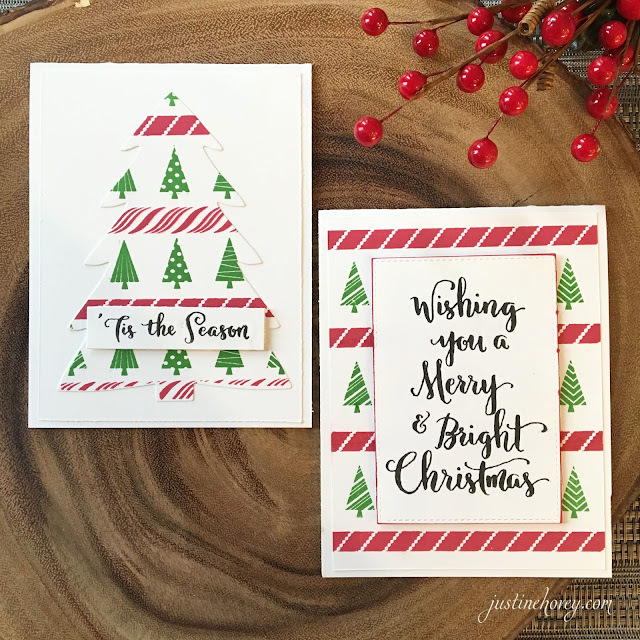 I love traditional red and green for holiday cards and I seemed to use them a lot more than in previous years. I truly hoped you enjoyed the last 12 days and 14 video tutorials! Don't forget to check out all the previous posts for the other giveaways which will close Thursday! Thank you to Winnie and Walter for Sponsoring Today's Giveaway! Simple and classic! Thank you for a wonderful series! Nice cards Justine. Looking forward to next year's 12 days of Christmas! Thanks for putting together such an inspiring event! I really appreciate that you showed how we can change gears if we have an mishap while creating, and can still create beautiful things. This is my first year of your "12 Days of Christmas" event, and I have loved it. I am going to the archives to watch previous videos too. Thank you for all your awesome videos in this series! Super inspiring! Thanks for sharing your mistakes and how you saved the card. I have enjoyed your 12 Days of Christmas videos, thanks for doing this and sharing your cards. Love the cards! Thanks for sharing your mistakes and how to fix them! Have enjoyed your 12 days of Christmas cards videos! I love both of those sets from Winnie and Walter! I like the border stamp to decorate the envelopes... great idea! Thank u got the chance to win one of the 12 days of Christmas! So many great points in this video. It was great to see your inky fingers work around, to see the Catherine Pooler inks in action, and I love the Merry and Bright set. The fonts and sayings are perfection. I love those stamp set they are great and the one is so versatile. Good job. Very pretty and bright. Such festive cards! Wonderful 12 days of inspiration! Thank you for sharing!! I love these simple but elegant cards. Thanks for taking the time to share these 12 days with us. It's been fun and so many beautiful cards! It's been fun following along with the 12 days of Christmas! Not only were there tons of new product, tips and ideas, there are new to me artists and companies to follow! Thanks Justine, there is always so much work behind the scenes that no one sees, to make all these videos for us! Merry Christmas! Thank you for this fast and easy idea! Nice Save Justine! Thanks for keeping it in your video! I am knee deep in my Christmas Cards and have made a few mistakes myself,seems like it’s just not a great cardmaking day unless there is at least one! I love these two cards and the sentiments! Thanks for sharing how to be creative when making mistakes! Enjoyed this series! Love the simplicity of both of these. Thanks for sharing with us and inspiring us. Also, a big, big, thanks for doing this 112 Days of Christmas series. It is such a relief to know we all make mistakes! Thank you for all of the beautiful inspiration! Two really cute cards today. Love' m both. Thanks for this series! Love the fix, cards came out so cute. The trimmings stamp set is awesome. Thanks for sharing the 12 days of Christmas, I now have so many ideas to do my Christmas cards. 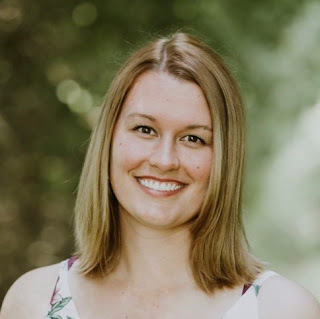 I really enjoyed this blog hop! Thank you so much to everyone that participated. I loved all the cards everyone made. They were very inspiring! I love Winnie & Walter products! And I totally know the feeling of "saving" a card ruined by inky fingers! Great cards! I love how you made them different but with the same stamps and it's always great to see mistakes that happen. We are all human and finding out how others fix their mistakes is a plus for me. Thanks for the 12 days of tutorials! I've enjoyed each and everyone of them. commitment. this has been a wonderful 12 days. learning new techniques and designs. thanks for doing all of this work. 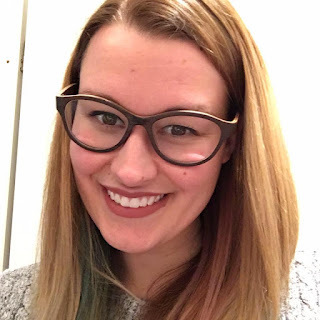 Thank you for making the time to make these 12 days of videos, Justine! I have enjoyed watching each one and will miss seeing them daily. Love the techniques and tips you have shared as well as all the amazing products you've showcased making your cards! Thank you for doing all of these videos, I enjoyed them and got so much inspiration from them. Your cards are beautiful and it's always nice to know how to fix mistakes on cards - inky fingers can cause me to say bad words! Beautiful cards! I especially like how you used the border stamps to create the whole card. Thanks for sharing this series with us! Thank you for sharing your love for crafting with all of us for 12 days! That’s the best kind of sharing! Thank you Justine for all your inspiration during this series! Pretty cards! Good tips on fixes! I have enjoyed your 12 Days series! Thanks so much for all the work you put into the posts and the videos! Thank you for all your hardwork and sharing new ideas and techniques in making cards. You really are an inspiration!!! You rock Justine! I manage to make some kind of mistake on my cards so I'm fixing a lot! Thanks for your inspiration!! Great cards! Thanks for sharing your mistake fixes :) And thank you for the 12 Days of Christmas series. I really enjoyed it! Love these cards and how you saved the day! LOL The stamps are great and I love the fonts (and size) of the sentiments. Such a fun and inspirational series and I am sad to see it end but I can see where it would be a tremendous amount of work for you. Thanks for doing it and I certainly appreciate all of the time and work you put into it! 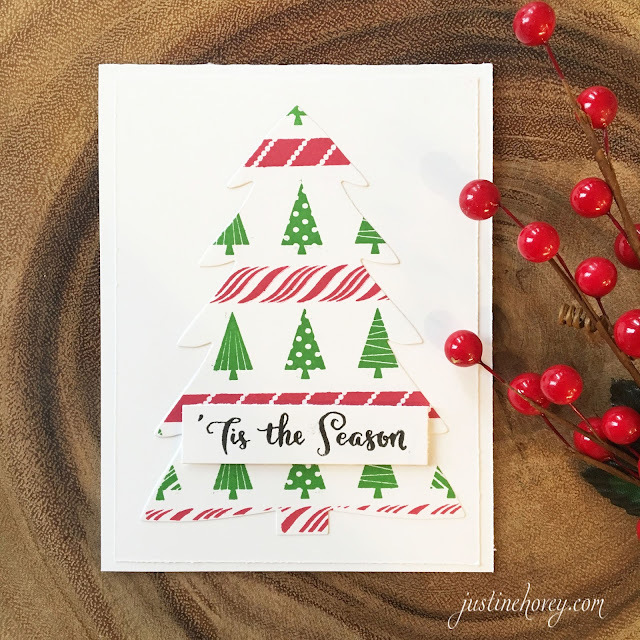 Hi Justine, thanks for another great video and showing how a simple stamp can make such lovely festive cards and do show us your mistakes and how you fix the, we all make them. Loved the series, will miss your video tomorrow! Thank you for all the 12 Days of Christmas cards. Love the variety and your creativity. Great cards and stamp set. Love the borders that can be used year round. You did such a nice job with the 12 days series. You've inspired me to get cracking on my holiday cards. Thank you for the inspiration. Your series is a great way to kick off the Holiday Card season! Thanks for the inspiration!! Love these cards!! Those would be so easy to mass produce, and they are so cute!! Thank you for your 12 day series. Loved all the cards. Thank you! This has been great! I love your ideas!! Isn't it great when you can rework a mistake and it looks good! Love the simplicity and elegance of your cards! I love these cards and thank you for sharing your techniques mistakes and all it's what makes crafting fun. Simple but beautiful. Thank you for showing us your awesome cards. 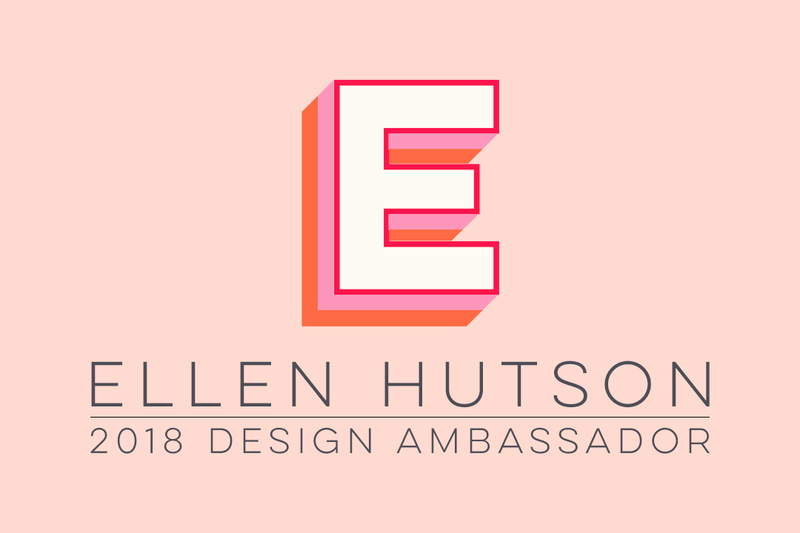 These are such lovely designs, and we can all use tips on how to work with mistakes! You made me kaugh with your inky finger! Oh how many times I've done that same thing! Great save though!!! I just received the Holiday Trimmings from W&W and plan to order the other stamps/dies you used in your cards. Can't wait to see what I can create! Cute cards. Like to see other people getting ink where they don't want it :) Thanks for posting the series. Thanks Justine, really enjoy watching your video's. These cards are awesome very simple to make. Thank you Winnie and Walter for the great give a way, love those stamps. Thanks for your Christmas series. You provided a lot of inspiration. Your video really sold me on the Gina K set even though I had seen other videos using it. Thanks for the opportunity to win gifts. Have a wonderful Christmas. Love the cards! Thanks for not giving up, but persevering! Thank you so much for your "Twelve days of Christmas" card series. I enjoyed them all. I too, make many inky fingers smudges. My monotombow ink eraser is my lifeline since I don't have many matching dies. Sometimes I fussy cut. Your cards today were cute, I like the idea of using them on the envelopes. Great stamps and can't wait to get new inks. This was a great series, full easy to recreate cards and techniques. Thank you! I have throughly enjoyed your 12 days series and thank you for sharing! ! Thank you also for sharing how to fix smudge fingers mistakes!! Great series.. Thank you so much. Love today’s cards. Thank you for showing how to fix when things don’t go as planned with our cards. This has been a great event. Thank you for all the hard work in putting this altogether. Thank you to all the sponsors of the giveaways for this event. Awesome simple cards! Thanks for sharing! I’m sad that the twelve days went by so quickly. I’ve really enjoyed watching your videos and learning about different products and techniques. And I really like your style. I’ll definitely be watching your blog. Have a Merry Christmas. Thank u for all the great ideas!!! Beautiful Christmas cards!! I really love the backgrounds that you made!! 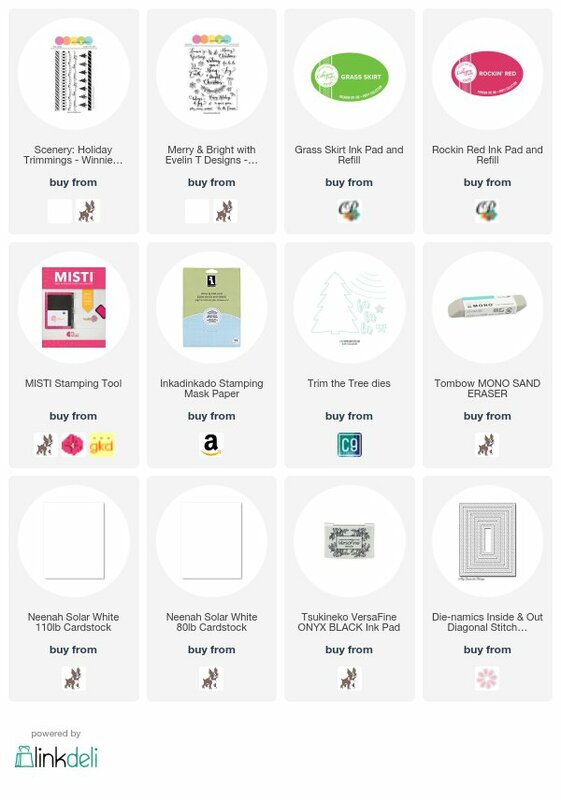 You're so correct- any background is easy to make using the Misti!!! Thank you for sharing your mistake too!! It helps me to realize that you all make mistakes too. These cards are so simply, yet so nice. Thanks for your inspiring ideas! Happy Holidays to you and your family...thanks again for a fabulous series!!! Holiday Trimmings was such a cool way to end (sob) your Christmas series. I love this set. Thanks for sharing all your ideas and talents. I really enjoyed it. These cards are wonderful just like all the others. I have really enjoyed your 12 days of Christmas series and I am looking forward to making all my Christmas and holiday cards this year! I love how sweet & simple these cards are. I like it that you left in the video the way you fixed the inky fingers on your card. Thank you for such great inspiration with these 12 videos! what a wonderful 12 days of Christmas! Thanks for all you do and for the videos. Love them all! These are so amazing and I have stamps in my collection to do this same technique! Thank you, thank you, thank you for the inspiration! Love it. Loved all your 12 days of christmas!! Great cards. I still love the traditional colors! Thanks for the inspiration. You are so right!! This stamp set would be amazing for stamping on envelopes! ❤ gorgeous cards! So cute and simple -- love your work! Thank you for sharing your talent and ideas with all of us~~So fun! Love these ideas as well. I dont know how you keep coming up with them. I hope in the end you wil l share with us which are your favorites and which you plan to use. First I want to thank you for another awesome holiday card series! Congrats too! Love these cards, especially using background pattern for a large diecut. Love the fonts on these sentiments by W&W too. Cute card designs with these stamps. thanks for this wonderful series. Thanks for all your hard work! Love the series! I love the stamp sets! You did a great job creatively using them! I really like the way you kept your "finger prints" on the card and then showed how to save it!! Love these stamp sets. Two more beautiful cards!!! This has been an awesome fun filled inspirational event! Thanks so much for all the wonderful cards & videos! Your cards are so creative and I appreciate all the time you devoted to this blog! Great stuff. These cards like all the others are wonderful. I am sorry to see the series end but I have subscribed to your channel and look forward to many more creative and inspiring videos. Thanks so much for sharing your talent! Winnie & Walter stamps + Catherine Pooler Inks + your immense creativity = an incredibly lovely set of cards! Talk about a winning combination of products and designer! Thank you for today's video (the save tip was timely!) and the 11 beforehand; your inspiration sees me finally focusing on my Christmas cards! Great cards. Love how you fixed the mistakes. My first 12 days of Christmas and I loved every day! Such cute cards! I love the one with the stripes. Thank you so much for doing this series. It has given me so many ideas! I need to go back and see all your others. Again, Thank you!! It helps me when designers leave in the mistakes and how the card was saved. Thanks for the series, now grab a cup of something and out your feet up. I am a great one for getting smugges where they don't belong. Thanks for the tip! Love the way you diecut the trees out of the stamped borders! loved all your cards in the series, thanks for these simple ones too! I like the simplicity of your cards. Thanks for another awesome series. Thanks for all of the inspirational projects you've shared with us, it's been a fun series! Thank you for the 12 days of Christmas videos, and for showing us how to use mess ups, that I do frequently. Thanks for sharing these 12 Days of Christmas videos. They were all great. You videos are short and to the point and you keep the mistakes in. I like that as we all make them. Thank you so much for doing the 12 days! I loved it and got so many great ideas! Loved the cards!! I also love that I'm not the only one that inky finger oopsies!! Thank you very much for this wonderful series with soooooooooooooo much inspiration. Today's cards are great............real traditional type and colors. Beautiful cards today. I am sad that this series is ending. I had a lot of fun checking out the videos and learnt a lot. Off to check today's video now. I sure enjoyed your 12 Days of Christmas series, Justine! Thank you for all of the lovely inspiration! This stamp set is adorable! Love your cute trees! So glad you did not edit your inky fingers. Makes me feel better to know you also make boo boos. Great job saving the day, how you fixed the smudge. The cards are very cute, quick and easy. Thank you for the video. Cute cards, I love the CAS. Thanks you for such a great series with so many ideas and techniques. Now need to go back to look at you previous years. Thank you again! I'm sad this is the end of the series. I look forward to these daily. Have a wonderful holiday season. I really enjoyed the series. Thanks Justine. THIS was a really fun series, thanks for all the inspiration and giveaways! Awesome cards! Love the font on those great sentiments & the traditional red & green. These sets are sure to be a staple for Christmas cards. I have really enjoyed these 12 days of Christmas - all the great creations. Great cards! I really like how you used that great trimmings stamp set! It is gorgeous! 12 Days have gone fast for me. Thanks for all your work with putting this fun video series together. This has been a great series! I really like how these cards turned out. What a fun way to used those W&W stamps. Also loved seeing these CP inks in action, since these two colours arrived today along with the new SOA Winterhaven box (finally). Thanks for the inspiration! Lovely, lovely inspiration. This has been just an outstanding series. Thank you! Thanks for the tips. Your cards are lovely. Your videos are informative and fun to watch. I have enjoyed watching all of your 12 days videos. Learned a few things that I hope to use in my cards. Cute cards! Thank you so much for sharing card ideas for the last 12 days. They've been fabulous! I love this series, I learn new techniques that I promise use it for the card thar I will made for this holiday. Thanks for sharing all this card. Thank you for all the inspiration this year. I really enjoyed these cards. I love simple designs, and these cards are just the kind of thing I love to make, so thanks for sharing. I absolutely LOVE the first card and wish you'd left more of it showing. So bright and cheery and lovely execution.